UNITED NATIONS, Jan 1 2014 (IPS) - Hours after forces ostensibly under Riek Machar’s command claimed victory in the strategic South Sudanese city of Bor, the former vice-president and once again rebel commander announced he would – after a week of postponement – send an envoy to upcoming peace dialogues in Addis Ababa with regional leaders and representatives of his one-time superior and comrade, President Salva Kiir. Tuesday had been the deadline put forth by the regional body IGAD for Machar’s troops to lay down their arms and abide by the ceasefire agreement they formulated during talks in Nairobi without any rebel input. Ugandan President Yoweri Museveni, an ally of Kiir, has stationed troops at Juba’s airport, and Monday appeared to threaten deployment of the Ugandan army to defeat Machar if he did not step down. “We gave Riek Machar some four days to respond and if he doesn’t we shall have to go for him,” said Museveni. Reports of the government’s defeat or retreat in Bor capped several days of dramatic but erratic reporting centring on a group of up to 25,000 Nuer ‘youth’ – known as the “White Army” for their practice of rubbing ash over their bodies – who had marched on the city on behalf of Machar – though even that allegiance wasn’t entirely clear. Machar is an ethnic Neur, Kiir a Dinka. The two leaders were militarily united during the Second Sudanese Civil War that lasted until 2005 – a war that killed over two million – but their ties had frayed since Southern Sudan voted for independence in 2011. In July, Kiir sacked Machar and several cabinet members in a move widely seen as a power grab. Yet worried about stability in the country, Kiir suffered little reprimand from an international community that – outside of oil revenue – in effect funds many parts of the government. Machar has denied Kiir’s allegations that a Dec. 15 skirmish at the presidential palace between Dinka and Nuer army factions was a coup attempt, though immediately after the confrontation he fled the capital to administer rebel forces that materialised almost instantaneously from army deserters and smaller militias. But at the U.N. on Tuesday, the secretary-general’s spokesperson could not confirm reports that Machar was willing to lay down arms. And with the conflict still festering, over 70,000 have fled the ongoing battles in Bor. The U.N. has called on international donors to fill a 166-million-dollar gap in emergency funding for aid groups in the country. But for many of those groups, most of whom have been forced to pull back workers to the relative safety of UNMISS bases, without a cessation in violence, there is little that be done for the over 100,000 displaced Sudanese who have not been able to reach a base. And depending on the damage, NGOs like Oxfam, which builds sanitation and water projects in South Sudan, could be forced to start from scratch. “With a cease-fire, if it does happen, we’ll need three to six months to get programmes in place, depending on the level of damage,” said John Watt, deputy regional director at Oxfam, speaking from Juba. "It's frustrating." Nationwide, 180,000 have been displaced. In the majority Dinka capital during the days after the palace clash, members of the national army were seen testing Nuers with Dinka phrases before rounding up and later murdering some of those who failed. Dinka elsewhere in the country told similar stories after surviving attempts on their lives at the hands of Neurs. “We have discovered a mass grave in Bentiu, in Unity State, and there are reportedly at least two other mass graves in Juba,” wrote Pillay. The number of U.N. peacekeepers in the country is set to increase after an emergency Security Council vote last week approved an additional 5,500 peacekeepers – brought from U.N. missions in other parts of the world – bringing the total “blue helmets” to 12,500. That process, U.N. under secretary-general for peacekeeping operations Hervé Ladsous told reporters, could take up to three weeks. But the speed at which events have played out – within days of the Dec. 15 clash at the presidential palace, oil fields were suddenly the site of raging tank battles – raises questions about just how aware the international community was of the spectre of civil war and how far behind they are on Machar and Kiir’s bloody chess match. By the time the new peacekeepers arrive, the latest spasm of violence that has claimed over 1,000 lives may be over, but questions over Machar’s calculus and the viability of South Sudan’s democracy and civil society will linger. Adams says Machar couldn’t possibly have expected support from regional powers and knew his military resources would quickly dwindle. Machar’s simultaneous attack on Bor and his tacit agreement to send a peace mediator to Addis-Ababa suggests his calculus never included control of the country but was part of a strategic political power play, its mode familiar to local observers. 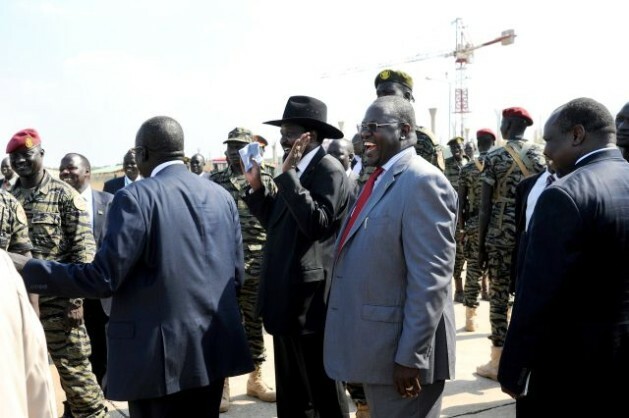 “History is important – power blocs and dangerous rivalries were part of how the SPLA and SPLM worked in the past. Factions rubbed against each other then cut a deal with one another, but in the past there was a bigger enemy in the North. Now they just have each other,” Adams said. Independence gave way to a single party state whose power relations tend to mimic those of the insurgent armies that the country’s political leaders spent most of their lives fighting in. Whether Machar launched a coup, then, while vital to a familiar narrative of events, is perhaps secondary to its context, says Florent Geel, co-head of the International Federation for Human Rights. “Kiir is very authoritarian and direct, so Machar wanted to get power,” Geel told IPS. Geel says because the government is made up of an uneasy continuation of a military coalition, disagreements are common among the group of fair-weather allies still accustomed to resolving border disputes via proxy wars with the North. “It’s not just ethnic, it’s political,” Geel said. In the meantime, the U.N., the media and countless Western NGOs are holed up in UNMISS bases, providing vital aid to and coverage of those inside, but unable to assist or learn about the at least 100,000 displaced Sudanese who have not been able to seek refuge. Compared to the recent U.N.-sanctioned and French-led missions in neighbouring Central African Republic – discussion of which has been subsumed by South Sudan at U.N. press conferences – as well as Mali earlier in 2013, the U.N. and NGOs on the ground appear hesitant to engage belligerents or call out those who have committed crimes against humanity. “NGOS invested so much in the success of South Sudan that some might have ended up with rose-tinted glasses on when it came to the harsh reality there,” said Adams. This, he says, has fostered a feeling of rampant impunity that was never addressed in the south as it was attempted via the International Criminal Court and elsewhere, in the north. “If those responsible for atrocities are known then the U.N. needs to be naming names. There needs to be a change in the posture of the mission,” Adams said.